Many people probably know about this wonderful game Legend of Oasis or the Story of Thor 2, which was released on the console Sega Saturn. 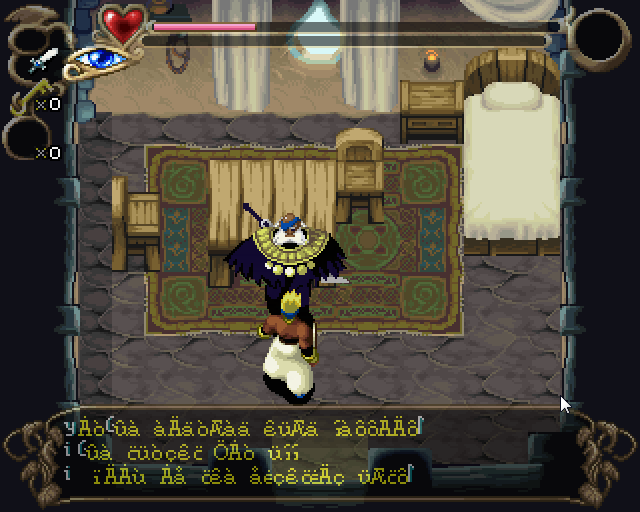 I've been wanting to translate this beautiful game in my native language. But the problem is that the fonts of dialogs somehow packed. I was able to find the exact location of the font. It is located in the file CHR.BIN from address 0x4A800. I find it difficult to determine exactly where the package ends.Please help us to unpack this compressed font. Only this font limits the beginning. Here is the uncompressed font, taken from the dump of video memory. No one is interested or can not cope? If it helps, here's the archive files. There is a binary file with a font that has been extracted from the video memory. Also in the archive there is a palette file for clarity. Font format 4bpp linear + Row interleaved. I worked with this game some years ago to translate to spanish language using a modified font including all spanish chars, but I never found the font because I'm not a Saturn expert. Now I analized again the game and I was able to decode the data. Also, I can encode the data using a fake compression to modify the graphics directly with any of the usual tools. - the game uses a variable font width, where the data are stored? Wow, great job! Can you share your tools for unpacking / packing of resources? I know where to get the palette. At the expense of Offset "0x4A800", it can be calculated from the size for packed data. But I did not yet know. I figured it by eye. I found a palette for fonts and loaded it into a tile editor. With the right palette to locate the font was not hard. Unfortunately I do not know yet where the offset value of compressed images and font widths. I'm finishing a tiny tool to replace the 2 decoded fonts and check that the new CHR.BIN works. Very well, I'll wait for the final result. Repacked font was larger in volume than the original? The remaining compressed data were displaced? I still would like to look at the your tool. The file can be greater or less than the original, but the game crash. All data are OK, and I can decompress the data without problems, but the game don't accept the new file. I'll try another encoding to see if it works. I can't help you If this is a pointer problem. A Sega Saturn expert is needed. And if you adjust the size of the new compressed data under the old - the game still will not start? The game only works with the same encoded size. Adding o removing a single encoded byte causes a crash. I can expand the file to make it bigger, adding zeros at end, and the game run fine, so the file can be expanded. The pointers to the data are needed. Tomorow I upload all, and a brief explanation of the compression. It's a very simple method. One man had promised me to share information about CPU registers of SH2. I think if I get this information, I can find the necessary poiters. Yet I found pointers of dialogs text and labels and know the necessary offset. Some progress. I calculated the pointers, who is responsible for the coordinate of the withdrawal of the font. In our case, it does not give anything special, but it's something. I would like to find more values ​​corresponding to the size of the font. The compression starts @ CHR.BIN:0x043000, after a big Shift-JIS font not used, until end of file. Run "dec.bat" to decode all files. A log file is created, "decode.log". "font.exe" replaces the 2 encoded fonts by the 2 decoded fonts, but you need seach and modify the pointers. Text dialog pointer has a simple, consisting of 2 bytes and presented in the form of addresses beginning of the line. A variety of labels are offset 0x2da000. So much for the file TH2.LOW. As for 0TH2.BIN - offset is 0x4000. Thank you for the program, I will look into it and if there are questions, I'll accomplish your goal! How about of the real compression of extracted data (not fake)? And if possible, is it possible to adjust the size of the new compressed data to the size of the old? I checked - fake compression does not work. I rebuilt the disk image that you can use the new CHR.BIN. But the game freezes after you select "new game". Then I changed the font number 2 to the one that was used in the Japanese version of the game. These fonts are different in size, but with the substituted font game worked perfect. Conclusion - in the case of the font replacement pointer is not needed, since the data is decompressed sequentially. We just need to compress the fonts correctly. PS: By the way, a font number 1 can be ignored, as it is not used. And another question - what is meant by the two bytes after the size of the compressed data? For example: "28 00"? Why are they the same for both fonts? Tha japanese font is smaller as the english font and seems to work. The font is the same, but now the game crash. So what do we do now? What are my options? Real compression applied? You were right. If exceeded the size of the compressed data of the original, the game will not work. Although decompression is performed after all - I learned this by watching the video memory. I think there is another way - to reduce the size of the font data by removing superfluous. Then compress the data. The size of the new compressed data is guaranteed to get less than the original size. By the way, your tool will not decompress all the data in the CHR.BIN. At the beginning of the file is still compressed logo and title screen. Is it possible to make a tool to request the address from which we should start unpacking? I just decoded the final section, where the font is stored, looking for more fonts. Tomorrow I modify the tool to accept the offset as parameter. Tell me, you do not want to try to write at least a simple data compressor? Unless of course you have the time for it. I finally got a file with documentation of Saturn. I will study it. If you're interested, I can share the information.